Sword Art Online focuses almost exclusively on its hero, Kirito—and when it doesn’t, it tends to follow the main female lead, Asuna. But what happens to all the other characters when Kirito and Asuna are busy with the main story? The answer is this manga: Sword Art Online: Girls’ Operations. 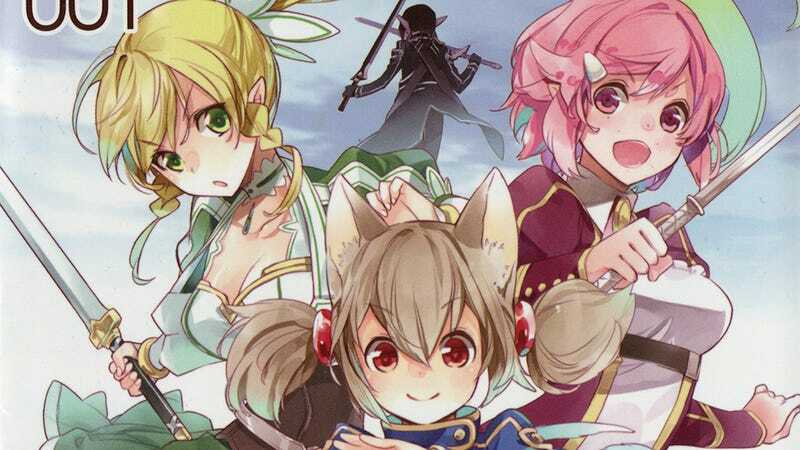 The first volume of Girls’ Ops follows the sub-heroines of Sword Art Online: Leafa, Silica, and Lisbeth as they explore the fairy-filled world of the Norse-themed ALfheim Online. However, when a once simple quest adapted from Sword Art Online takes a surprising turn, the group finds themselves outmatched—that is, until a dual-wielding, black-clad swordsman arrives. There’s just one trick: Their savior is not, as the group expects, Kirito (who unbeknownst to them is in Gun Gale Online at the time). Instead, they meet Lux (or “Kuro” as she is called at the time). While Lux has no problem helping them when she stumbles upon them, she has no interest in joining their party. Yet, the group of three girls decides to follow Lux and join her in the quest anyway—feeling that there may be something they can do for their mysterious savior. Frankly, Lux is the character that makes this whole manga worth reading (which is probably why she’s a DLC character in the new Sword Art Online game). As well as some new faces. What makes Lux so compelling is that she is a fundamentally broken person. Like both Silica and Lisbeth, Lux is a survivor of Sword Art Online. Unlike them, she suffers from severe PTSD due to what she experienced there. The only reason she has come to the reborn Aincrad is to get a momento item that she once was given by a friend—a friend who then died in the virtual reality death game saving Lux. The idea of being in a party—of being responsible for the lives of others in a fight—is too much for her. On a rational level, Lux knows that if people die in ALO, they are fine; it’s just a game, after all. But the broken part of her feels it’s real—that life and death are as real in ALO as they were in SAO. And that certainty keeps her on the edge of breaking when Silica, Leafa, and Lisbeth decide to follow along. Lux’s mental instability gives real weight to the events of the manga. If any of the girls were to perish during their quest, Lux would certainly suffer a full mental breakdown—and the stakes are raised even higher once the other three girls realize this. Another aspect of Lux’s mindset is that she has more than a little in the way of hero worship going on when it comes to Kirito—since he did free her and 6000 other people from Sword Art Online. So when she joined ALO and her randomly generated character looked almost exactly like the black swordsman, she took it as a sign and began emulating (though not impersonating) him in the game world—going so far as to teach herself how to dual wield. Consequently, she sees herself as a fake—not a real person worth anything. Watching her overcome this insecurity—at least in part—and finally import her original avatar from Sword Art Online into ALO is an incredibly satisfying resolution to the first arc of the story. The second volume of the series has far less depth and instead focuses on a light-hearted (and fanservice-filled) side story where the girls participate in a “Hero of the Beach” competition to earn cash for armor repairs. As you can likely guess, there is a lot of focus on the scantily-clad nature of our heroines—and yes, tentacles are eventually involved. That said, while much of the story is fanservice and comedy, it does serve to further develop Lux and her relationship with the other three girls in meaningful ways. The final chapter of the volume also has some interesting teases about what is to come—as well as clues about exactly what kind of person Lux was back in the world of Sword Art Online. While the second volume is a bit of a letdown when compared to the first, Sword Art Online: Girls’ Operations is an enjoyable addition to the Sword Art Online universe. The focus on a flawed heroic lead fighting to overcome her past and heal keeps the story interesting. But the question that looms over the story is what will keep you coming back: What will happen when Lux’s history finally catches up with her? Sword Art Online: Girls’ Operations runs in Dengeki Bunko Magazine and has been collected into two volumes so far. The first volume has been officially translated into English.